WAFFLES: Hey Boss! 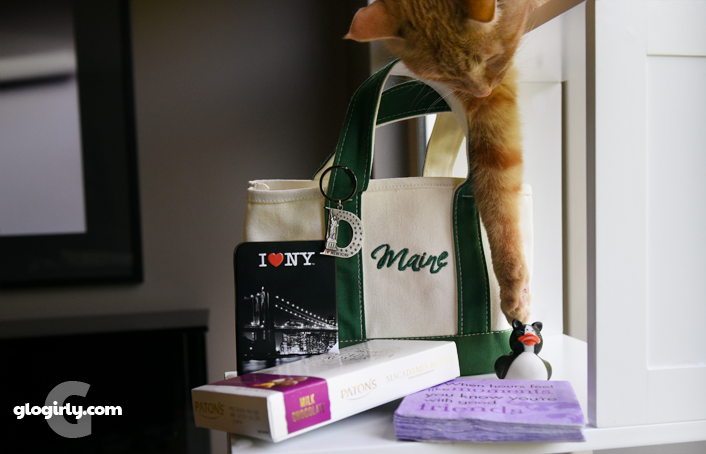 Check out all the COOL loot we got to bring home from the big BlogPaws conference! I thought this was a feather, but Glogirly says it's called swag. KATIE: What makes the swag we're showing everyone today really special is that all of it was given to us from our friends at the conference. 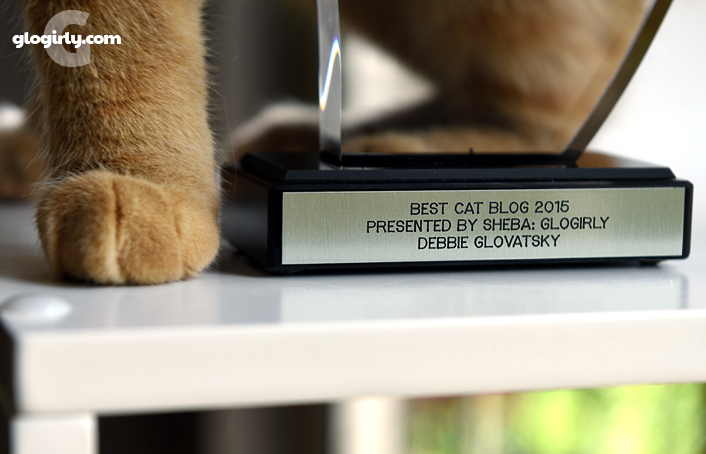 Every year a number of cat bloggers that attend bring gifts for each other. Sure, we still get swag bags from the conference filled with some pretty great stuff. WAFFLES: But the primo stuff is from our friends, right? KATIE: Right. And that's really the best part of the conference too. Friends. And chocolate. For Glogirly, that is. WAFFLES: Uh, about Ashton's Chicken Emporium... do they deliver? If Glogirly had been organized and on top of things, she would have written down notes about all the cool stuff we received and who gave it to us. But she's giving us some lame excuse about having her paws full with us. So if we've left anyone out... please accept our apologies! Another highlight of BlogPaws is the big awards banquet that's held on the last night of the conference. 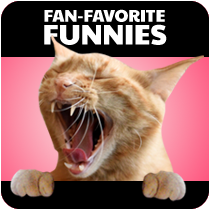 It's particularly fun because many of the cat bloggers have a tradition of sitting all together to cheer each other on. 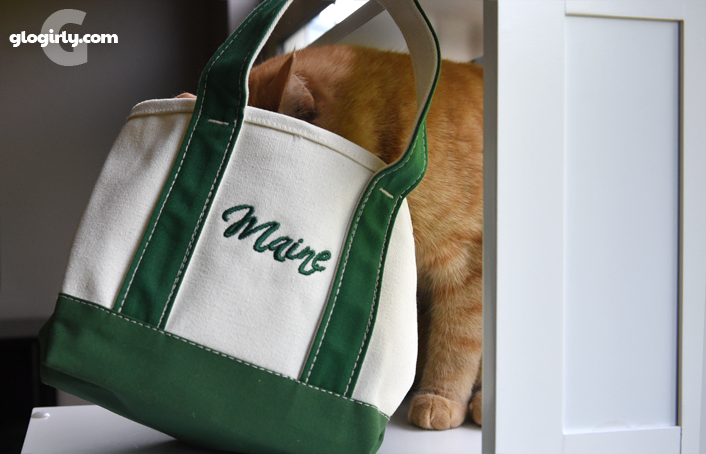 Cats may be outnumbered by dogs when it comes to bloggers and conference attendees... but the Cat Ladies definitely know how to make some noise! 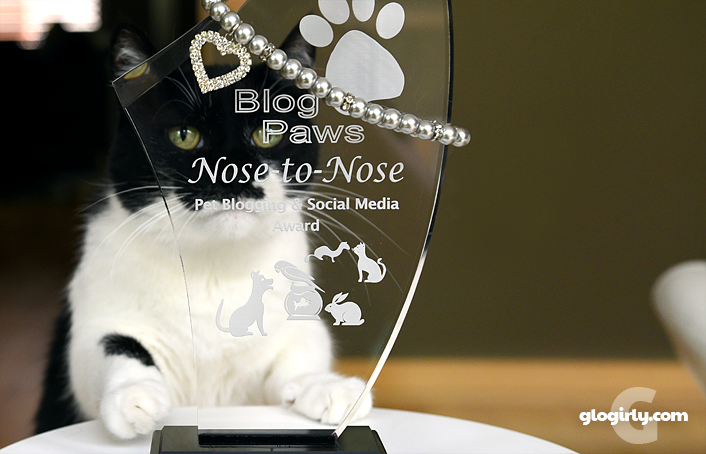 Remember a few months ago when we announced that we'd been selected as finalists in the Best Cat Blog category of the Nose to Nose Awards? Well we got to bring home a pretty cool souvenir!!! 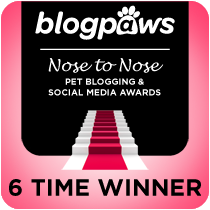 This was our fourth BlogPaws conference and our fifth Nose to Nose award. To say we feel honored and blessed is an understatement. 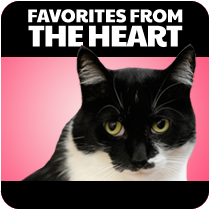 We'd be remiss if we didn't give a warm shout out to the other talented bloggers that were also finalists for Best Cat Blog. We're a small and close knit community of bloggers. 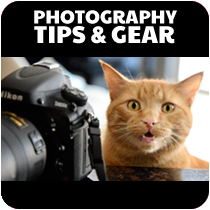 Many of us have become dear friends through our blogs, so it's very special when we have an opportunity to spend time together face-to-face or even face-to-fur. That also makes it hard when friends find themselves up for the same award. 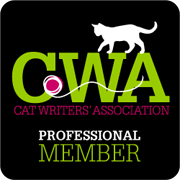 We adore our fellow finalists and have the utmost respect for the work they do to entertain us, inform us and help cats and their guardians. WAFFLES: So who's this Debbie Glo-something person? And how come it doesn't say Waffles? KATIE: Waffles, not everything is about you. WAFFLES: It's not? Are you sure?? 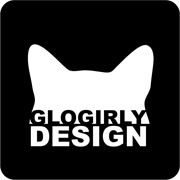 If it weren't for all of our wonderful friends, readers and fellow bloggers there wouldn't be a GLOGIRLY cat blog. It's you who make everything possible and inspire us to share our stories and antics. You mean the world to us. 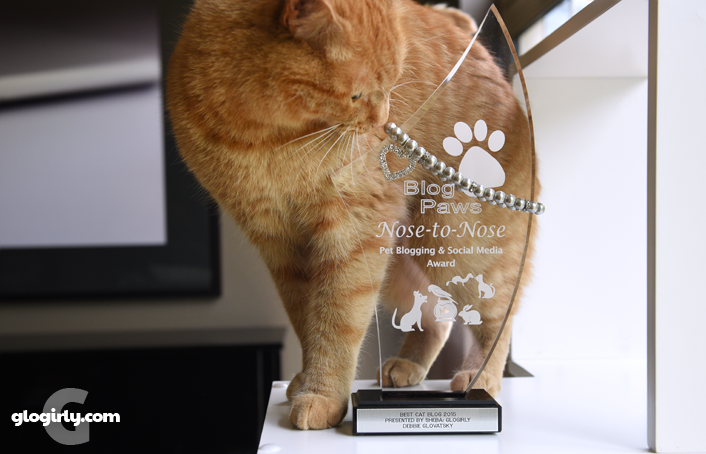 Being recognized with an award like the Nose to Nose is very special and meaningful to us. We're nominated by friends and peers, then a panel of industry experts does all of the judging. There's no begging for votes, no popularity contest. Best of all, each award winner is given the opportunity to select a shelter to receive a $500 cash donation, sponsored by Mars PetCare, that the shelter can use however they wish. Whether it's keeping the lights on, making repairs or buying supplies... the shelter gets to choose. So congratulations to the real winner: Our hometown, no-kill, all-volunteer cat shelter, Minnesota's Feline Rescue. 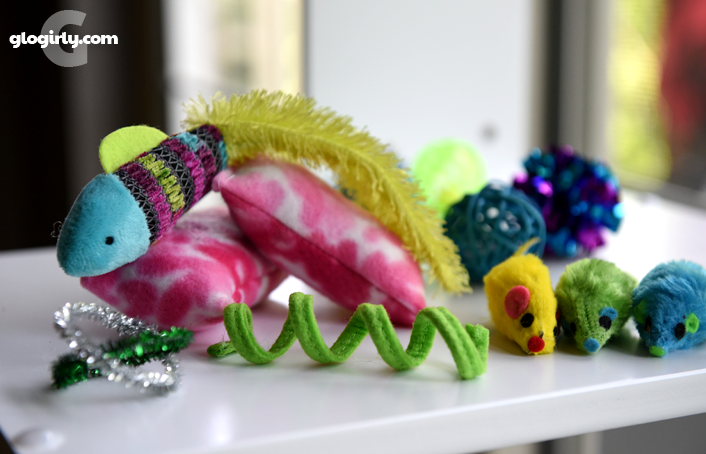 We had a BLAST at the BlogPaws conference and loved taking you with us! We are so excited that you won but we knew you would. Awww.. thank you, Patty. We really were very surprised! All of the finalists are so talented and dedicated. 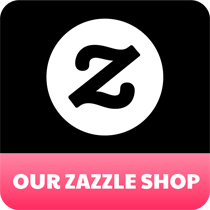 We love their blogs. Thank you so much! 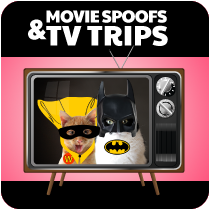 Between all the kitty and human swag, we've got lots to remember our fun trip by! We are very proud of all three of you. Hard working blogging friends. (Sorry Mum's not been well hence not commenting on your lovely posts). Oh, thank you so much Team Dash! We're so sorry to hear your mum is under the weather. : ( No apologies necessary! We're glad you like the chocolate! Congrats again on the Nose to Nose... And thank you for continuing to entertain and delight us with stories of Katie and Waffles every day. Glogirly was so tickled to meet you! And VERY impressed that you flew all the way from down under! Glogirly is savoring the yummy chocolate and we are actually taking turns with our colorful fish toy! (... for now!) We hope you have a smooth and safe trip home and we hope very much to see you again! Concatulations on winning! That's some cool swag too! Thank you, Kitties! We're very excited!!! Glogirly loved meeting you, Summer!!! She said you're as sweet and beautiful in purr-son as you are in your wonderful photos and blog! Congratulations on your award! Wow, lots of great swag! Lucky kitties! Congratulations again on your award! So well deserved - your blog brings smiles to me every day. Awww... thank you, Ingrid! It warms our furs to know we bring you smiles. We're loving all the swag the mom brought home for us...but you're right, the gifts from our furiends are the bestest! Congrats again on your award...so well deserved. Somehow we ended up with TWO of your pink fleecy catnip kickers! ...and BOTH are getting plenty of use. Of course, Waffles wants to play with whichever one Katie is playing with. haha! Glogirly LOVES the magnet! We all were super happy to see the Yellow-Haired Lady! It was fun traveling with you through your blog. Congratulations on your well deserved win! We had so much fun on this trip, we hope to take another short kitty trip sometime in the future! Congratulations on your award- you truly deserve it :) And such great gifts from your friends too. Awww... that's so sweet. Thank you!!! 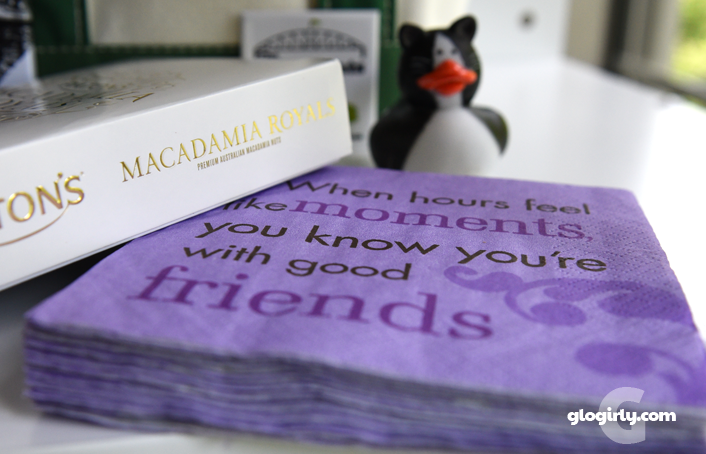 Spending time with friends is definitely the highlight! A very well-deserved award, and so nice for your choice of shelter. Mom is quite jealous of the camaraderie she knows you had with the other cat bloggers. Thank you so much, Simba! We're very excited for the kitties of Feline Rescue. Glogirly would love to meet your mom someday. Some of her very best friends are cat moms she's met through blogging. Great writeup! Sad that I didn't get to spend more time with Waffles & Katie. 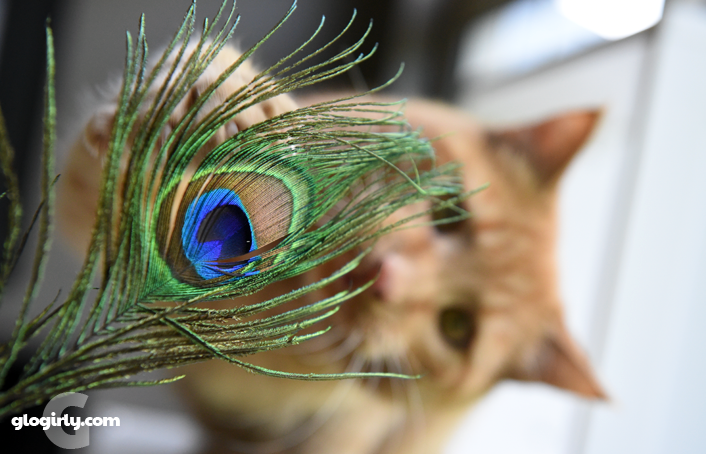 Although I was afraid I might cheat on Jean Pierre with another handsome orange cat. It end being Russell! Thank you, Christine! I bet you got a few sniffs from the kitties when you arrived home! Don't worry, we won't tell. Thank you so much...and congrats to you too! Very exciting!!! quite a haul.....and a wonderful and well deserved award!! The swag was over the top, that's for sure! Thank you so much... and please kiss those adorable kittens for us! Concats on that win! It was great to see you and meet Katie. Our Mom has been in slow motion and we still haven't got our swag. Looks like primo stuff! I have yet to even open my suitcases.. I am so so far behind..
Concats Debbie..Katie..and Waffles on another well deserved award and some awesome swag..I would also like to say a BIG thank you to all of you bloggers that work hard everyday to show the world how wonderful cats are..and for helping shelter kitties have a chance to find love and a furever home...Bless you all!!!! We watched the live broadcast and saw you win! We thought you gave a wonderful acceptance speech. A huge concats on the win. That is amazing you've won 5 awards. You deserve it for the wonderful fun and beautifully photographed blog you and Katie and Waffles produce. It's a lot of work and you do a fantastic job. Thanks for sharing your trip with all of us, it was fun to see it through Katie & Waffles eyes. Congratulations again. 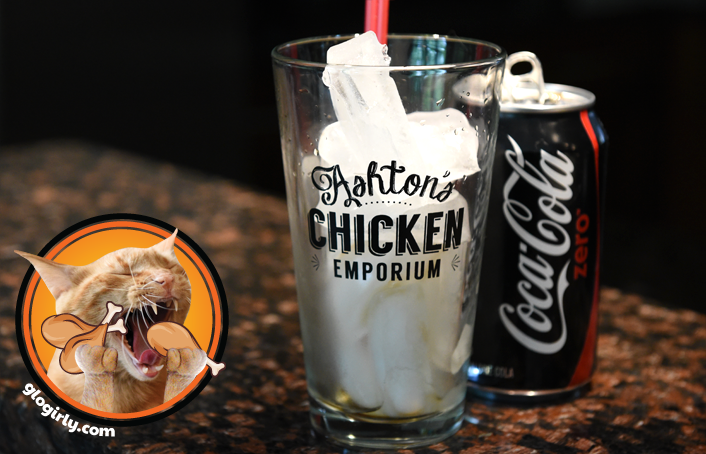 We have an Ashton's glass as well... Now where's that chicken?! What a lovely post!! Well done again on your well deserved win! You are right, the others are also great bloggers and good friends! That's totally pawesome!! Congrrats on the well-deserved win. Concatulations on your win! We are *so* happy for you! Congratulations! It sounds like you had a wonderful time..
Glad yous all had a good time. Sowry weez missed seein' ya'. Maybe next time. 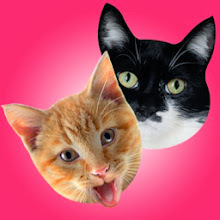 Concats on your award...we is so happy to hear your stories and see all the pawsome photos of you Katie and Waffles. You always have so much fun! Whoa! Top billing! Concats on the award. I wish TW could have been at the cat table but it only holds so many. I’m glad Pop stayed home with me since TW didn’t really get to meet Katie. This will probably be her last Blogpaws conference unless there’s one in NYC or Boston and NYC is out cos they have a ferret ban. Lots of good stuff. Mum wishes she could go, but said she doesn't get enuf baycation to take off for that long. Says her day hunting place is stingy! Maybe when she retires. WOW, that a lotta loot that you got at Blog Paws. What fun you will have. Thanks for taking us on the road with you. 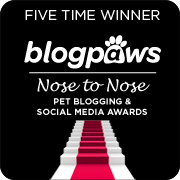 Thank you for taking us along to BlogPaws via your blog ... it was fun to follow along, since we were not able to attend this year. Concatulations on an award truly well deserved!!! ConCATs on your win!!! Much deserved. Congrats to you guys and thanks for your mention and your congrats on our award. it was great seeing you! -Alana and Crepes. Concatulations on your win!! Mommy said she rang her cowbell so loud!! MOL We're glad Glogirly liked the stuff we sent with Mommy. Just got caught up - CONGRATS! And as always enjoyed the on the road posts too. Keep up the great work my friends!! 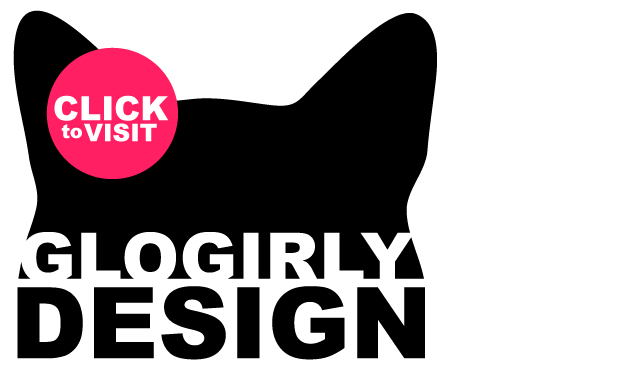 Concats on all that great swag too. So much deserved!!!! Congratulations!!! I'm am so thrilled for you guys! I will continue to support and love you! A HUGE CONGRATULATIONS!!! I don't know how I missed the announcement when I get your emails, just saw it on Facebook. I have been lacking in commenting, hard life lessons happening, I shouldn't ever not read yours though, they always make me laugh, and for that I thank you and am forever grateful. Concatulations! 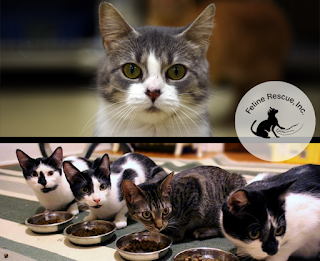 And we are also sooooo happy for Feline Rescue! !